Jim O’Connor, the Republican senator from Massachusetts, is charming, intelligent, well-spoken — and a future contender for the presidency. A handsome, charismatic family man, his ongoing affair with a beautiful journalist could prematurely shatter his White House hopes — a problem that is seriously compounded when he discovers his mistress brutally murdered in her Boston apartment. Suddenly O’Connor is a homicide suspect — with November on the horizon and a tough re-election campaign spinning out of control. 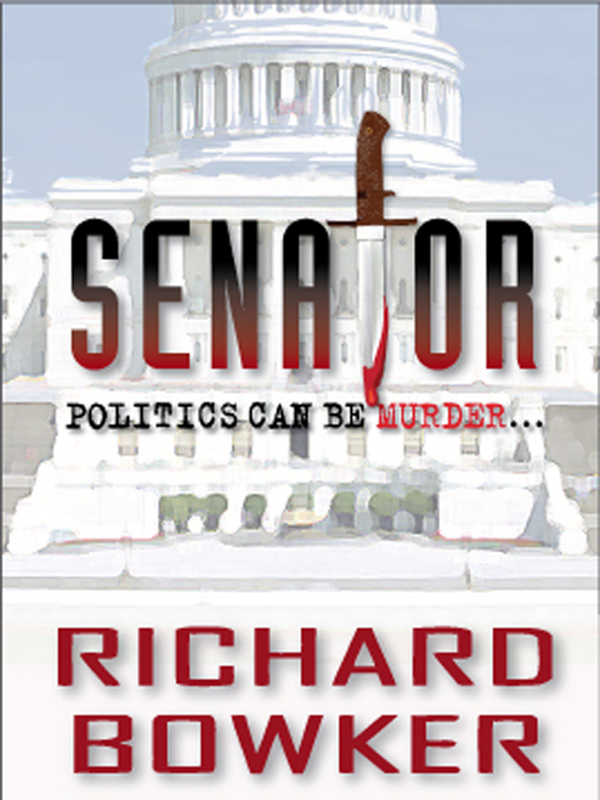 And now the Senator must hunt down a killer in the capital of lies — in order to salvage a badly battered political career…and, perhaps, save his own life as well. This is a lightning-strike of a book. In the first chapter, popular U.S. Senator James O’Connor finds his mistress murdered in her Boston apartment. A homicide investigation could destroy O’Connor’s political future and his marriage. As O’Connor searches for the killer’s identity, he questions his own. Is he the man who “wants to be more than a politician” or a puppet to his own ambition? Bowker’s crisp writing and sensitive character portrayals make this mystery a true novel. Kept you guessing til end, lots of twist and turns. Better yet was the way he writes about politics in Washington, where lies are told til they believe they are the truth. The characters in this novel are well-developed, complex, and interesting. There is enough humanity in each of them to allow the reader to truly care about them. The plot unfolds like butter. It feels as though the main character, the voice, of the novel is talking to the reader directly. This novel leaves me hungry for more of the author’s works. Richard Bowker creates a full character in Jim O’Connor. Successful, but filled with doubts like all experience in life. Events beyond the hero’s control determine his destiny, again like reality. No villains, no angels is the hypothesis and the author makes a good case for the answer. I’ve ordered his other works. I stare at the blank screen, and that is the first thing I can think of to write. It’s astonishing, really. I have never thought of myself as a politician. I certainly didn’t plan to become one. Even as I campaigned, as I shook hands and kissed babies, gave canned speeches and attended endless fund raisers, it didn’t occur to me that these activities were defining me; I always thought of them as simply a means to an end. Until now. Now, when it has all changed forever. I’m a politician, and I have just finished the toughest campaign of my life. But it isn’t just the campaign I want to write about in this unfamiliar room, on this intimidating machine. Because I want to be something more than a politician, and that will require an understanding of far more than the mechanics of running for public office. It won’t be easy to find that understanding. But this is where I have to start. The battle had been shaping up ever since Bobby Finn announced in late spring that he was going to run against me, but the public didn’t pay attention until after the primary. Couldn’t blame them; we were both lying low—raising funds, doing research, plotting strategy. Neither of us had opposition in the primary, so we spent our time stockpiling ammunition; better to do that than to use it up early and risk having nothing left for the final struggle. But even when we started in earnest, people were slow to react to the legendary confrontation. The pros blamed it on the weather. It was a soggy September. Flights were delayed, parades canceled; people at factory entrances and subway stops rushed past us to get out of the perpetual rain. Even indoors the crowds were small and inattentive, worried more about whether their basements were flooding than about who would get their vote for senator. Maybe after the baseball season, the pros thought. Eventually they would have to take an interest. Eventually they did, but Lord, it wasn’t the way I wanted. I may as well start with the Friday evening it all began. Just another speech—this one to the Newton Republican Women’s Club. Not an especially important event; I was preaching to the converted, and there were only a couple of local reporters there to take my message to the masses. My mind was far away, but still, it went well; the fine ladies laughed at the jokes and applauded at the proper places and were generally thrilled to be in my presence. A politician is an actor whose performance never ends. Kevin Feeney was with me. It was his job to grab me away from the fine ladies as soon as possible after my speech. Let them blame him, not me, for not staying longer. Sorry, ladies. I’m a slave to my schedule, and Kevin is its keeper. He did his job—he always does—and together we headed out into the fog and drizzle. He held an umbrella over the two of us as we stood in the parking lot. “Let me drive you home, Senator,” he said. Kevin still didn’t look happy. His wife and children came in a distant second in his loyalties. But I wasn’t going to argue with him; I had more important things to do. I got into my Buick and opened the window. “Go home, Kevin,” I repeated. And then I left him standing forlornly in the parking lot. I didn’t feel sorry for him; in fact, I didn’t give him another thought. Kevin would always be there. I drove along Commonwealth Avenue, an oldies station on low, the windshield wipers keeping time with Neil Sedaka. Generally I like driving alone—offstage, if only for a while. But tonight the pleasure was soured. I had a problem, and I had to solve it by myself. At a stoplight I picked up the car phone and dialed a number. After the fourth ring the answering machine clicked on: “Hi, this is Amanda Taylor. I can’t come to the phone right now, but—” The light turned green, and I slammed the receiver down. Maybe she’s there, I thought. Maybe she just isn’t answering. But maybe it would be better if she weren’t there. I had a key. Newton turned into Brighton, and the big old Victorian houses gave way to dorms and apartment buildings, laundromats and convenience stores and bars. I come from Brighton, but not this part; this was academic territory. First Boston College and then Boston University, the campus sprawling in urban disarray on both sides of the road for a mile or two before petering out in the dance clubs and record stores and pizza joints of Kenmore Square. To the right, the light towers above Fenway Park blazed in the darkness; the Red Sox were trying to get the game in despite the fog. Big advance sale, probably. I cursed silently: ten thousand extra cars in the neighborhood. I made my way through the chaos of Kenmore Square traffic and into the Back Bay, where Commonwealth Avenue became elegant once again. I didn’t pay attention to the stately elms and old brick town houses, though; like everyone else in the Back Bay, I was looking for a place to park. The best I could find was a “residents only” space on Gloucester Street. I decided that I didn’t have a choice, so I pulled into it. I got out of the car and opened my umbrella. At least the fog would make it less likely that I’d be recognized; I didn’t need a conversation about abortion or someone’s Social Security benefits just now. I started walking. If she was there, what would I say? It was important not to lose my temper. I didn’t need an argument. Above all, I didn’t need her angry at me. And I did need to know what was going on. If she wasn’t there, I would have to wait for her. This couldn’t be put off. The building was on Commonwealth, between Gloucester and Fairfield. Out front a low hedge surrounded a magnolia tree, glistening in the light from an old-fashioned streetlamp. Black wrought-iron bars enclosed the windows in the basement and first floor. In the basement I could see the flicker of a TV through the bars. A woman approached, walking a Doberman. The Doberman paused at the streetlamp; the woman stared at me. Where had she seen that face before? I hurried up the front steps and inside. I closed the umbrella and glanced around. A row of mailboxes to the right. On the wall next to them, a handwritten notice about a lost cat. On the floor beneath, a few faded sheets advertising a Scientology lecture. The ever-present smell of disinfectant. I had caught a whiff of the same disinfectant once in a bathroom at a fund raiser and found myself becoming aroused. I expect that will happen to me again someday. I rang her bell; no answer. I didn’t want to hang around the lobby. As usual someone had left the inner door unlocked. I opened it and hurried up the stairs. I never took the elevator. You can avoid being seen if you pass someone on the stairs; it’s impossible in an elevator. I took out my keys and started looking for the one I wanted. By the time I reached the third floor, I had found it. The door was there in front of me. My heart was pounding—from racing up the stairs; from the tension of the coming confrontation. I put the key into the lock, and that’s when I knew that something was wrong. The wood around the lock had been splintered and gouged, as if someone had attacked it with a hammer. I tried the knob; the door was locked. I turned the key, and the door swung open. “Amanda?” I called out, closing the door behind me. On the floor next to the bookshelves I saw several large shards of glass. It took me a moment to recognize them; they were the remains of her crystal ball. “I wish I knew where all this was going to end up,” she had said to me once, smiling wistfully. “I wish I had a crystal ball I could look into and see the future.” So I had bought one for her. A joke. It was the only present I had ever given her. It had never done her much good, and now, shattered into a dozen pieces, it looked more useless than ever. I wanted to run away. I wanted to rewind the tape and start over again. This wasn’t it. The scene was supposed to be entirely different. She should be standing here, beautiful, frightened, apologetic. She had made a mistake. She could explain everything. Nothing for me to worry about. But my will wasn’t strong enough to change reality, and I knew that running away would only make things worse. So I forced myself to move through the apartment, pleading with God to make it empty. They swam in my vision; they merged and twisted as I stared at them and tried to change their meaning. They are only words, I thought. Words can lie. Or they can just be words, sound without content, a speech to nice Republican ladies. I walked past the words and into the kitchen, and that’s where I found her. She was sprawled on the black tile floor. Her white shirt was torn and bloody; her eyes were open, and they stared unblinking at the ceiling. They seemed amazed that this was the last thing they would see. I reached down and touched her wrist; she was cold. I looked around wildly. Was her murderer lying in wait for me as well? But I had searched already; I was alone. I closed her eyes, and then I closed my own, slumping down beside her on the floor. The apartment, the city were silent; the only sounds were the hum of the computer in the next room and the thumping of my heart. She was cold. She was dead. At that moment I would have given back everything I had accomplished, everything I had achieved, for Amanda to be alive again. But it wasn’t going to happen. My life ticked inexorably onward, and gradually my grief yielded to the pressures of the moment. After a while I forced myself to open my eyes. I haven’t been to a great many crime scenes in my life, but I’m not unfamiliar with murder. I tried to look at Amanda clinically. No rigor mortis, so she’d been dead less than eight hours. On the floor, the bottom of her arm was purplish from the blood settling there, so lividity had started. That meant she’d been dead at least a couple of hours. Someone had murdered Amanda in the late afternoon. And I thought: Exact time of death is going to be important. Her clothes were intact, except for where she had been stabbed. At least she hadn’t been raped, thank God. There was a bruise on her right forearm—where her attacker had held her? There were cuts on her hands and arms—where she had tried to defend herself? On the floor near the sink I saw a kitchen knife, its blade dark with dried blood. I recalled using that knife to chop celery one evening. Oh, Lord, I thought: fingerprints. And then the pressures started to overwhelm me. I had to do something. I was in terrible trouble. —and immediately felt stupid and evil. It had been months since I had used the knife. My fingerprints couldn’t possibly have been on it. What mattered more: saving my career or finding out who had murdered Amanda? But then I realized that finding out who had murdered Amanda was just as likely to end my career as having my fingerprints on the knife. This murder couldn’t be a coincidence. So what should I do? Run away? Go outside and howl in the fog? I couldn’t think of anything that would help. I don’t deserve any credit for it, but finally I decided to do what civilization had taught me to do. I went into the bedroom and called the police. I gave the dispatcher the address and told her there had been a murder. She asked for my name, and I gave that to her as well. She didn’t seem surprised. There are plenty of James O’Connors in Boston. “I need you,” I said. I gave him the address. I hung up. I didn’t feel like chatting with Roger. I sat on the edge of the bed and looked around. Lights were on, I noticed: in the living room, here in the bedroom. Did that mean she had been alive into the evening? The time of death matters. So what? Amanda was dead. I looked down at the black comforter on the bed. Black comforter, black rugs, white walls. “Why is everything black and white?” I asked her the first time I saw her apartment. I was nervous; I needed to talk. “So am I a good guy or a bad guy?” I persisted. The words were filled with menace in the remembering. I thought of her white shirt, now stained red. I thought of her white skin turning purple against the black floor. I heard sirens. I thought of what I had come here to find out. Too late for that now. If it was here, hidden somewhere in the computer or the pile of floppy disks, I was ruined. But I thought: At least I can’t let them find out we were lovers. Yes. A Polaroid snapshot we had taken with a timer one night after a bottle of wine: the two of us kissing openmouthed on the edge of the bed. Where I was sitting now. We didn’t stop kissing when the flash went off and the camera spat out the photo. Afterward I suggested that we burn it, but she refused. “I need something to remind me of you when you’re not here,” she insisted. Were those words another lie? I hadn’t thought so at the time. She kissed me again, and I didn’t object when she kept the photo. She had put it in the drawer of her night table, beneath her birth control pills. Could it still be there? Perhaps she had thrown it away in anger or despair; more likely she was saving it for evidence. I opened the drawer. The pills were where I remembered them; I picked them up, and there was the photograph. I stuck it in my pocket without looking at it. And then I held my head in my hands and started to cry for the first time since I was twelve years old. Top notch reading! Can’t wait to see it as an ebook!